Lack of motivation could be the reason why a person is leading a mediocre life . It could also be why a person keeps failing at one’s ventures. A sign evident of lack of motivation is disinterest in the job. One could also go on to feel just depressed and unhappy. Even doing the regular work or normal duties becomes a challenge for the person. However, this needs to change. Motivation is what keeps one going and helps one to complete good jobs. This article here, tries to discuss ways in which one can learn how to overcome the lack of motivation. In the meantime, if ever a person lacks the motivation to complete an activity or job, the first thing that someone needs to do is to find out the exact reason why one was all set to do the job? What is the idea behind it, or rather why the particular action needs to be completed? One can also try to go back and wonder at the reason, why one opted to do it. One thing to realize is that if in case, someone lacks motivation to complete the action or to do a job, the reason could be that there is no specific reason to complete the act, or even a cause as to why things should be done. For example, why do people choose to stop smoking? There is an important basis for it. Hence, one can conclude that if one is able to find the reason, why one needs to achieve the goals and target, then one would also feel motivated enough to complete the action, successfully. Visualize the actions and jobs to to be completed to achieve success. What one needs to do is to concentrate and close one’s eyes, trying to picture whatsoever one wants, whenever or wherever one aims for. For example, one can assume that one is moving towards the kitchen, opening the fridge door to find the big juicy orange in it. Once it is taken out, the person cuts it and squeezes the juice into one’s mouth. It looks so real, that one could even feel the dribble in one’s mouth. In the meantime, the visuals were so real that one could get the taste of lemon in one’s mouth same as one could also feel the saliva. The main cause for this is that the mind is powerless to distinguish between visual and reality. Visualization , thus goes on to become the motivation to complete the action. That is one was so taken in by the visuals, that one hopes for it to be completed in reality. Thus, visualization becomes the motive for one to achieve something or to complete an action. The ambiance and environment has an important effect on one’s mood. At the same time, when one goes on to interact with flourishing business people, who normally talk about only business, chances are that one would also go on to talk about business. This shows how one feels motivated and goes on to utilize one’s atmosphere to increase the energy levels. That is why one should avoid interacting with negative people, as it could cause one to lack the motivation to do anything. Same ways, opt for positive and good atmosphere in order to work. Some might even use luxury products, so as to boost one’s confidence. One thing that one needs to know is that each person is unique with distinctive qualities that sets them apart from others. For this reason, one should quit comparing all their actions with others. Everyone should learn to respect themselves. Just make sure to be yourself and not do something just because other people are doing it. When a person gets stuck in the middle of something, one could lose the motivation to complete the action. What one needs to do in such a situation is to take it slow, maybe one step at a time, however difficult it may be. It could be something simple as listing the things to do, or even opening a document or even a notebook. The first step could be simple or insignificant, but it at least is a step in the right direction, encouraging one to take a second step and so on. In the situations, where a person is totally down and has no motivation to finish one’s work, one needs to take a note of one’s breathing and reactions when one is sad. At the same time, one’s demeanor changes when one is happy and excited. It is seen that more often than not, for most people, the rate of breathing increases, while the hands keep moving a lot in such situations. The speed of conversation also goes up, even as eyes keep darting in particular directions. It is quite evident from one’s expression and physiology if a person is upset, happy or excited. Hence, it is also seen that when one changes one’s physiology, there is a change in one’s state as well. For example, if one hopes to stay happy, one would need to change the physiology accordingly. There could be dozens of methods by which one can get motivated. Now, what one needs to do before getting on with the daily routine is to read a book, listen to music or inspiring speeches, whatever works for them to feel motivated. Just half an hour at the beginning of the day, would be enough, thus kick starting the day with a positive note. At the same time, people could also opt to watch inspiring videos or motivational speeches of leaders, so that one would be motivated enough to complete the job. One could also go on to have the right approach and attitude so as to get motivated. Reading, could also help one to get enough motivation. Success never comes to anyone overnight. One needs to work hard to achieve success in life. At the same time, one needs to be persistent. It could be not days or months, but years before someone reaches the position. For this reason, one also cannot neglect the rest. A person needs to take a break amidst one’s work to achieve success. One needs to take time or take a break so that one can come to terms with their own capabilities. Make sure that a person knows how much one can do. In the meantime, if a person has completed one’s work, they can go on to take a break, as a reward as well. Chances are that after a break, one could feel rejuvenated, motivated and ready to take on the world. Lack of motivation could also be because one is bored with the same old routine, without having made any changes. A person could as well opt to change that. One should stop doing the same thing that they have been doing for so long. Instead of that opt to do something different. To cite an example, instead of the daily routine of getting up late or could be some people opt to sleep late, go on to do the alternative. Decide on something different from the daily routine. Now, the best way for someone to get motivated is to believe in oneself. A person can come to understand what one wants and also come to realize that a person has the capability to achieve success. Go on to spend time with what you believe in or with what is important to one. Everyone needs to understand that a person cannot blame others, if one lacks the motivation to get a job done right. One need to realize that there could be a large number of reasons for a person to lack the motivation. Some of the reasons are mentioned below. 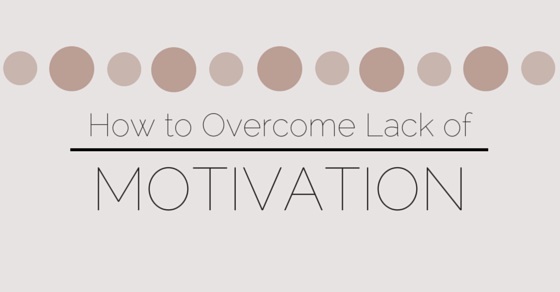 Failure to recognize one’s abilities, fear that one would fail, fear of the other’s opinion, laziness, too much nervousness or stress, absence of incentives and so on are some of the reasons contributing to lack of motivation. Nevertheless, one can learn to acknowledge these points and come to realize on how to overcome this lack of motivation to some extent.